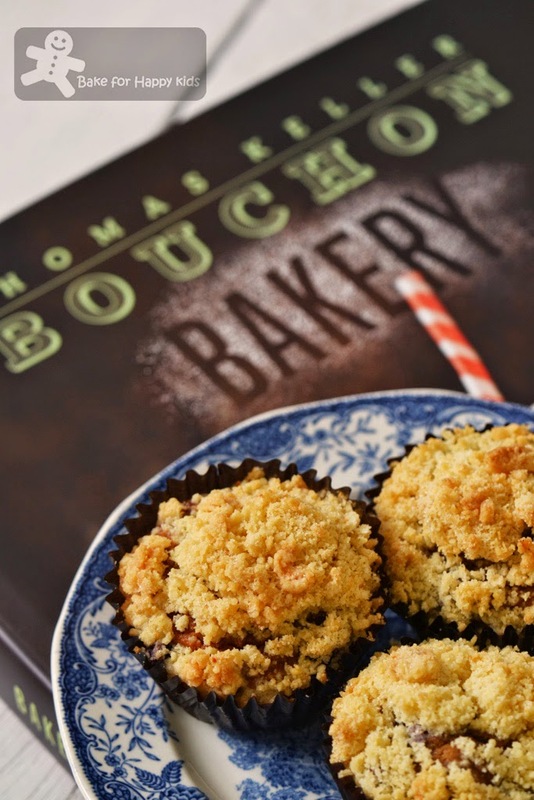 ... to buy this book, Bouchon Bakery by Thomas Keller and Sebastien Rouxel and also to bake these blueberry muffins. My first bite of these muffins tell me instantly that I have made a fabulous decision. Happy! Joyce from Kitchen Flavours has been telling me that the Bouchon Bakery book is really good. With no doubt, my heart knows that what Joyce said is totally true but my logical brain has telling me to persist my restrain from buying too many cookbooks. Ops! However, seeing Jessie's Thomas Keller's Lemon Poppy Seed Overnight Muffins have completely convinced my brain that what my heart feel is totally true. The influenced me was lured to have a glimpse of this book. For sure, a peek is never enough and so I bought the book! Hey, it is not my fault! This book is too irresistible and too good... LOL! Me (to me): Should I dash to any professional baking supplies shop to buy a super sensitive digital weighing scale??? Me (to me): Are these precision are necessary for my home style baking? Me (to me again): Is the extra 1g of flour, butter or egg making any difference in the end products? Me (to me again): Considering this, should we consider the facts that the flour and eggs sold in America and Australia differ in their composition and texture? Or are the flour and eggs selling in supermarkets differ from the ones that are supplied to commercial bakeries and kitchens? Or are the more expensive ingredients such as free range eggs or organic flour enhance the quality of bakes? So, back to my question... Seriously, will the extra or less 1g of flour or eggs or any other ingredients make any differences in my baking??? Ok. I should have enough of whinging here. I have decided to be less critical with the weighing of ingredients if I have to bake any of the recipes from the book. Instead of seeking for perfection in everything, I have sort of simplified this Thomas Keller's blueberry muffin recipe to suit my needs and of course, I didn't skip the overnight bit of this recipe as I'm curious too to see if this step make better muffins. 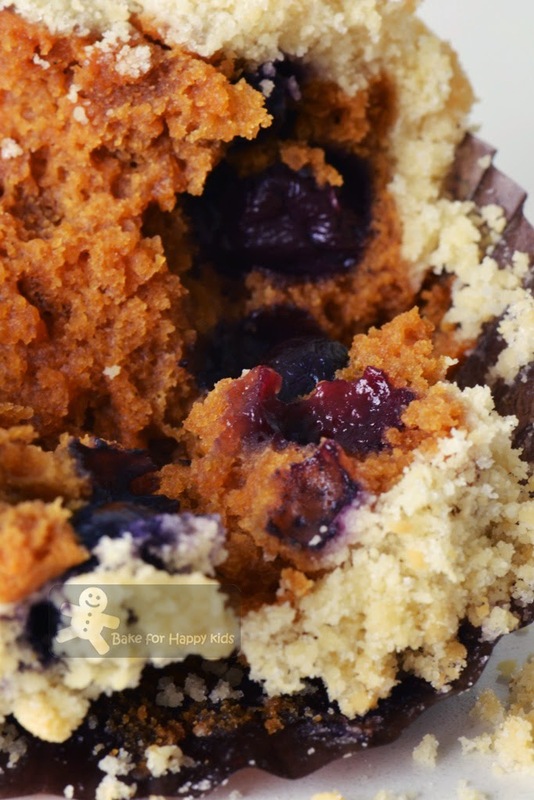 Instead of just mix-and-bake, these blueberry muffins can be slightly complicated to bake but I must say that the extra efforts and dedications are worthwhile as I promise you that the enjoyment of these muffins can be super rewarding and can't get any better if you eat these muffins for a Christmas breakfast! Does the overnight batter bake better muffins? I'm not entirely sure but I prefer not to question the purpose of this step because I believe in Thomas Keller. Hey, he has lots of baking experience, owns many bakeries and published a famous book! Me? I don't wish to elaborate my lousy status further... Ops! Whether being precise enough or not, I can't emphasize further baking these blueberry muffins is truly a fabulous decision!!! They were baked with an overnight batter as mentioned in this book. The Bouchon Bakery book says "The key to making a great muffin is letting the batter rest, to allow the flour to hydrate... When you make the batter a day ahead, it's ready to pour into the muffin pan in the morning so you can have fresh-baked muffins for breakfast"
Sounds rewarding, isn't it? I have to bake these again for our Christmas day breakfast! Beat in sugar, molasses and honey. Then, mix in the sifted dry ingredients and buttermilk alternatively. Ok... Store the batter in the fridge until ready to bake. We are not exactly done yet!!! I have made these too after mixing the muffin batter. ... bake! It take a longer time to bake because the muffin batter is cold. 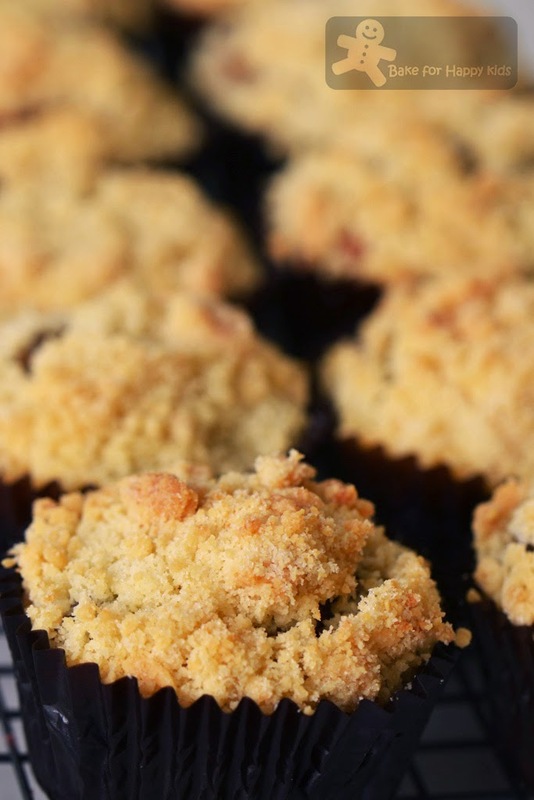 These cake-like muffins are so good that you don't need any icing sugar or butter to serve! Needless to say, I would highly recommend this recipe and will bake more of Bouchon Bakery recipes and also these muffins again. Here's my simplified version of the recipe that is mostly adapted from the book, Bouchon Bakery by Thomas Keller and Sebastien Rouxel as the amount of ingredients stated in grams are round-up or down to its nearest its five or ten grams. If you wish to be as accurate as Thomas Keller, please use the recipe in his book or follow the original precise amount in blue. 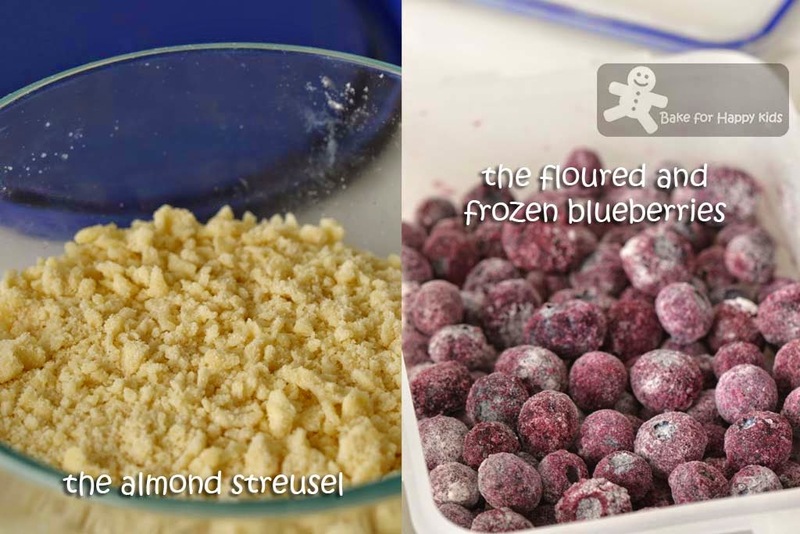 For the fruit: Toss blueberries with the 10g of all-purpose flour in a small bowl, and place in the freezer. 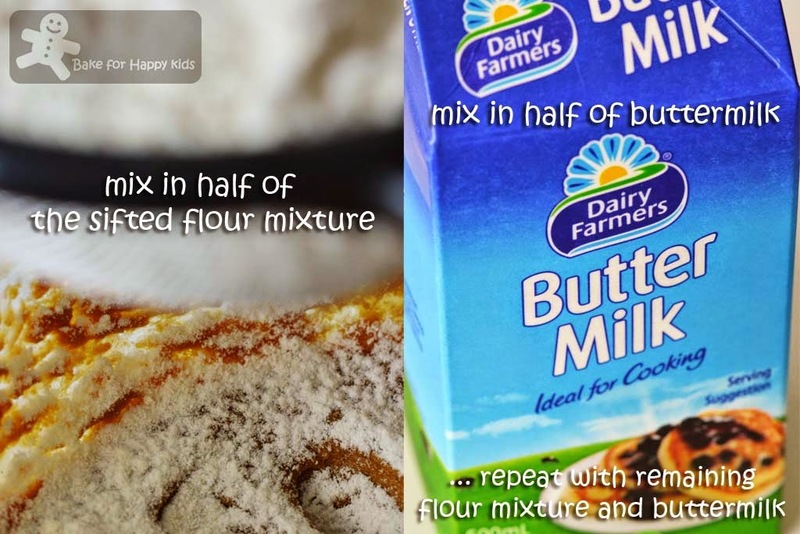 For the batter: Combine the 85g all-purpose flour, cake flour, baking powder and salt in a bowl. 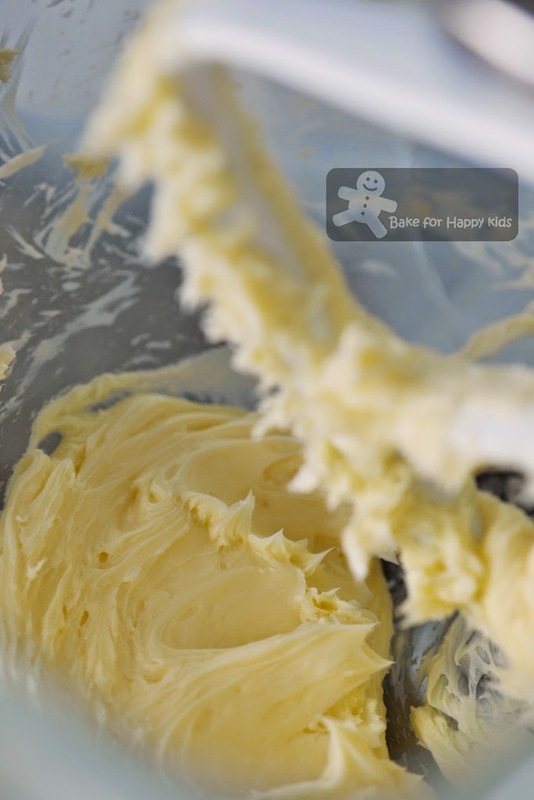 Using an electric mixer fitted with paddle attachment, cream butter in medium-low speed until smooth and creamy. Add sugar and continue to beat in medium-low speed for about 1 min or until the mixture becomes fluffy. Scrape down the sides and bottom of the bowl. 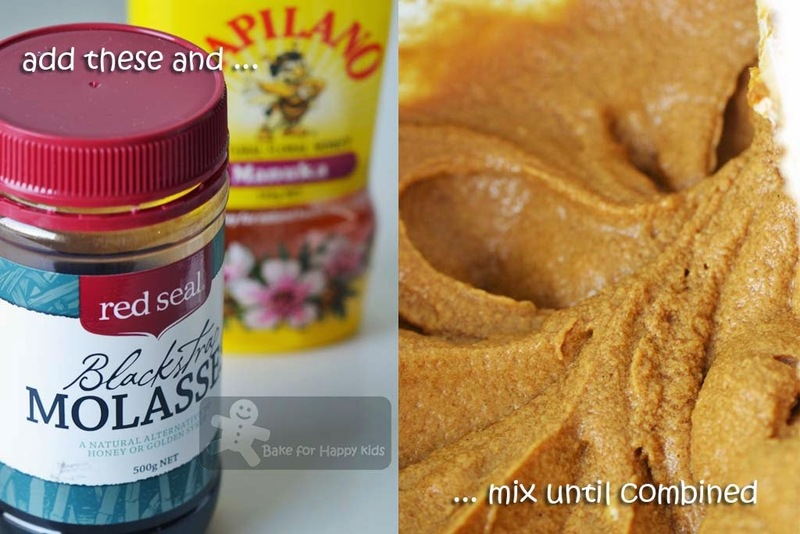 Add molasses and honey and mix on low speed for about 1 minute to incorporate. Add egg and vanilla paste and mix on low speed for about 30 sec or until just combined. Sift in half of the flour mixture and mix on low speed for 15 secs, or until just combined. Add half the buttermilk and mix for 15-30 secs to combine. Repeat with the remaining sifted dry ingredients, followed by the remaining buttermilk. Remove the bowl from the mixer and scrape the bottom of the bowl to incorporate any dry ingredients that have settled there. 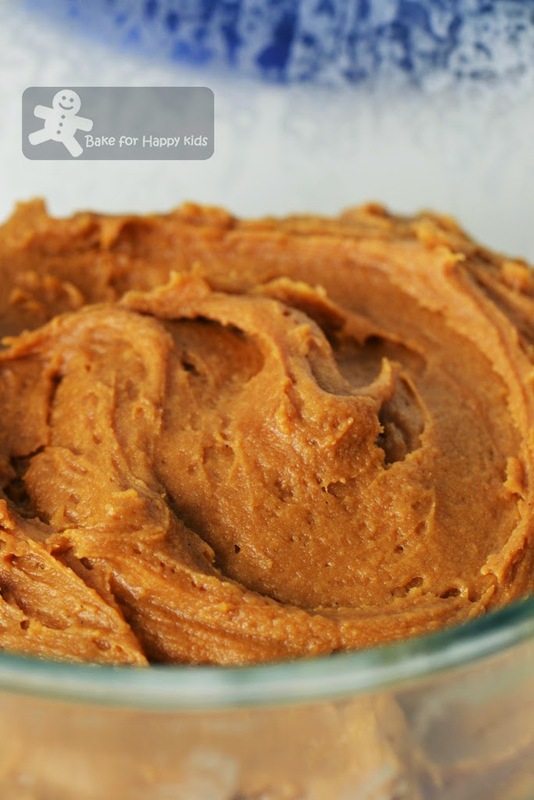 Transfer the batter to a covered container and refrigerate overnight, or up to 36 hrs. For the almond streusel: Combine all-purpose flour, almond meal, sugar and salt in a bowl and whisk with a fork to break up any lumps. Add butter and toss to coat the pieces. Using your fingertips, rub the butter into into the flour mixture. Do not overwork the mixture or allow the butter to become soft. If it does, place the bowl in the refrigerator to harden the butter before continuing. Transfer the streusel to a covered container or resealable plastic bag. Refrigerate for at least 2 hrs, or up to 2 days, or freeze up to 1 month. 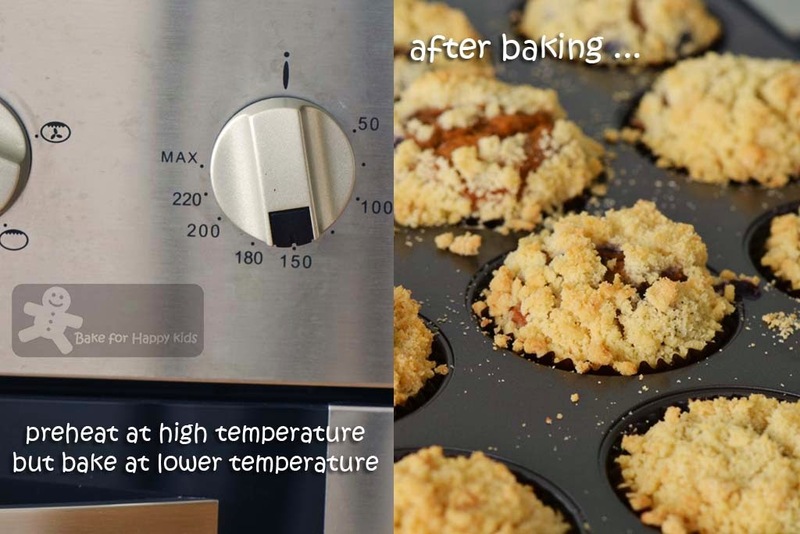 To bake the muffins: Preheat the oven to 425°F (or 200°C fan forced) Line muffin pan with muffin papers. Remove the batter from the refrigerator and let it sit at room temperature for 5 mins to begin to soften. Stir in the blueberries into the batter and spoon batter evenly into the muffin papers, stopping about 3/8 inch from the top. 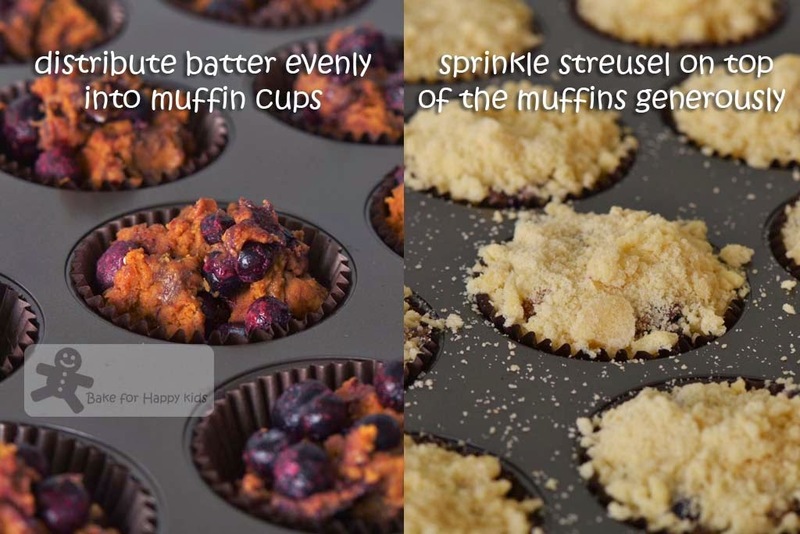 Sprinkle 2-3 tbsp of the streusel generously on top of each muffin and amount of streusel used depends on the size of the muffins. Place pan in the oven, lower the oven temperature to 325°F (or 150°C fan forced) and bake for 20 mins at 150°C fan forced and another 20 mins at 160°C fan forced to yield a golden brown on their topping. Please note the baking time required for baking these muffins is longer than usual as the muffin batter is cold. To test, make sure that a skewer inserted into the center comes out clean. Set the pan on a cooling rack and cool completely. Serve with icing sugar or a slice of butter if desired but these muffins are good enough on their and I don't think these addition is necessary. The muffins are best the day that they are baked, but they can be wrapped individually with plastic wrap or stored in a single layer in a covered container at room temperature for up to 3 days or frozen for up to 1 week. Defrost the muffins still in the container so any condensation will form on the outside of the container will not get onto the muffins. Place on a sheet rack and refresh in a 325°F oven (or 150°C fan forced) for about 5 mins, if desired. Morning dear.. I'm not a precise person.. I am ok with any recipes in cup, so I use the same cup for everything.. If the recipe is in grams, a bit mafan to me coz I don't use any weighing scale.. I have one at home, unopened, still in the package.. Hmm...Oh my, those muffins look so nice and crumbly.. I love crumbly stuffs, sure taste very buttery.. I can already imagine how heavenly your kitchen smells...love your muffins! Oh my! 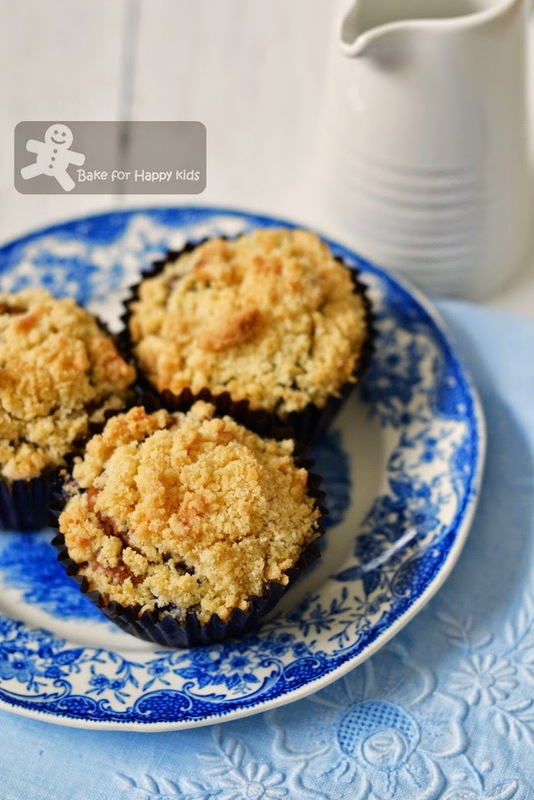 These Blueberry Muffins with Almond Streusel look great ! Muffins... how I wish to have some now ! Just love those blueberries hidden inside it. Yummm..
Zoe, looks like you had a good chat with yourself hah..hah... I guess we home cooks don't need to be so precise. Your muffins turned out delicious after rounding off the figures, so I guess it is alright LOL! Hi Zoe, you really can cook so well. How I wish I can sample your muffins. They look so irresistible. Zoe, I love Thomas Keller.....his recipes are really fantastic.. I gotta try this someday. I love any recipe, and I mean ANY recipe, from the Bouchon Bakery. Great book and great looking muffins! And no, 1g makes no difference to me! I can't tell you how many times I tried to get over here yesterday to get a bite of these muffins Zoe. I kept on doing just more more thing and before I knew it the day was over, lol...I see you talk to yourself much like me, lol...I shouldn't listen though and keep focused on the recipe especially when it comes to Thomas Keller. I totally agree with making the batter the night before. As a matter of fact, not only do I do that with muffins most times, it works really well with panckaes too. Oh delicious Zoe! I think of mini blueberry crumbles but instead you get the yummy soft insides! I have been browsing thru this book since last week! And planning to make something soon, have even KIV one of it for our BA! haha! These muffins looks good! Lots of his recipes requires an overnight rest, which I trust makes a difference! But I personally think a difference of 1gm would not make a difference! This book is fabulous! wink! Zoe, I really like the muffins, they look so tasty! If I show this post to my daughter, sure she will say "pls pls bake it for me". Thanks for sharing this delicious recipe. For me, the simpler, the better and this looks heavenly. You tempt me!